Grand Central offers insights into social studies topics including the history of technology, transportation, electrification, air rights, urban growth and planning, the Gilded Age, Progressivism, pollution, the growth of suburbs, government regulation, public safety, Beaux Arts architecture, the history of New York City, and more. Use part or all of the program, or delve into the rich resources available on this website to learn more. This guide is divided into three elements: comprehension, activities, and further suggestions for classroom activities. Use this activity with your students after they watch the program Grand Central. For each of the following statements, write T if it is true; if it is false, rewrite it so that it is true. The business tycoon Cornelius Vanderbilt, who built the first Grand Central, made his fortune in the oil business. Vanderbilt built Grand Central to service the trains of the New York subway system. When Grand Central was completed, it stood in the center of the most developed part of New York City. The trains that serviced Grand Central in the late 1800s were powered by steam. Before the fatal 1902 rail accident, the public had few safety concerns about the trains entering New York City. 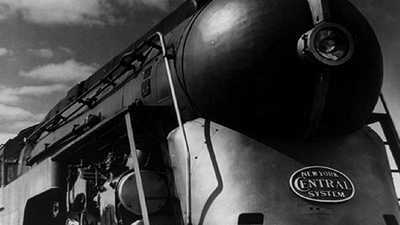 Following the 1902 accident, New York banned steam locomotives from Manhattan. William Wilgus designed a new terminal in which commuter trains would run parallel to the long-distance trains that serviced Grand Central. To help finance the new terminal, the New York Central Railroad leased the space above the underground tracks to private developers. New York City split the cost of building the new Grand Central with Vanderbilt's railroad company. Grand Central was shut down between August 1903 and September 1906 while the new station was built. Though some blamed William Wilgus for the fatal 1907 rail accident, the New York Central strongly defended him. The New York Central hired the brilliant but arrogant architect Whitney Warren to help design the new terminal building because of dissatisfaction with the existing plan. The original design for the terminal proposed by the firm of Reed and Stem was completely replaced. The new terminal was widely praised for its appearance when it opened in 1913. 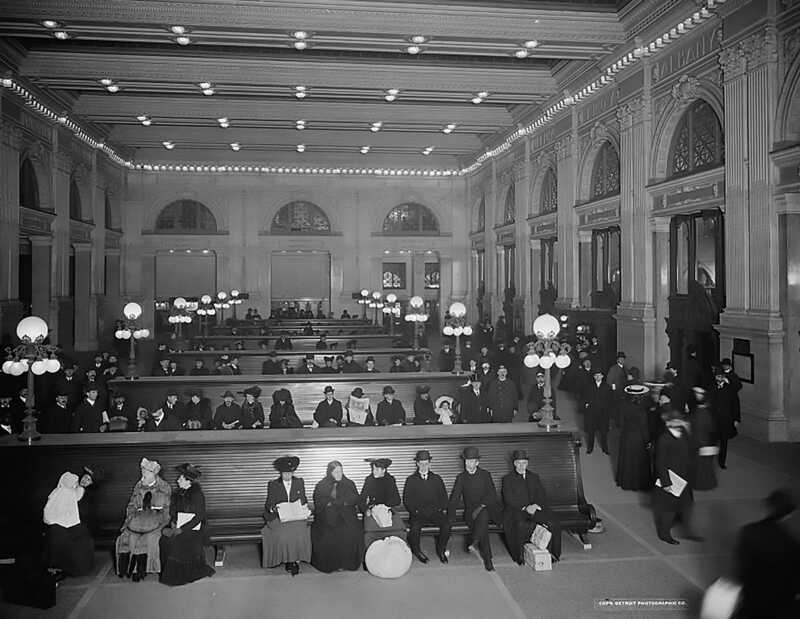 Grand Central looks very different today than it did in 1913. The "father of Grand Central"
Imagine that it is 2013, and for Grand Central's centennial, New York City leaders plan to hold a ceremony honoring the man most responsible for making Grand Central possible. But they can't agree on who that is: Cornelius Vanderbilt? Whitney Warren? William Wilgus? Assign each student one of the three men, and have each student write a 500-word statement that his or her assigned person would deliver to city leaders if he were alive, explaining why he deserves the honor more than the two other nominees. Ask for volunteers to read their statements to the class. When the presentations are done, hold a class vote on who should be the "father of Grand Central." Visit the gallery of photos of Grand Central and select the photo you find most interesting. Imagine that you were the one who took that photo (as a New York resident or a visitor to the city), and that you are now enclosing it in a letter to a friend or family member. In your letter, explain the circumstances under which you took the photo, what the photo shows about Grand Central, and your connection with Grand Central. Post the photographs on a bulletin board, and beneath each one, post the letters students wrote about it. How different are the stories these letters tell? As the film explains, Grand Central Terminal serves the New York City subway system as well as commuter trains from outside the city. Conduct an experiment to see how well students can navigate the rail and subway maps and schedules (as well as the websites) involved. Have each student team up with a partner to plan a day trip to New York City from White Plains, New York. Teams should take the commuter train from White Plains to Grand Central Terminal, then take the subway to visit the American Museum of Natural History, Rockefeller Center, and Wall Street (in any order), then return to White Plains. Each team should prepare a schedule for the day listing the commuter train they would take into the city in the morning, the subway lines they would take to visit the three sites in Manhattan, and the commuter train they would take to return to White Plains in the evening. Each team should also tally the cost of the train and subway trips required. Have teams outline their proposed itinerary on a sheet of paper and post it for the rest of the class to review. Which group's itinerary appears the most accurate and logical? 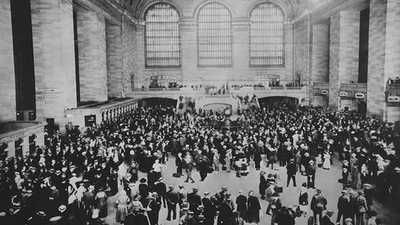 Read these examples of stories about Grand Central in New York newspapers, such as the Park Avenue Tunnel Crash of 1902 or the opening of the new terminal in 1913. Imagine you are a New Yorker who lived through all four events described here --- and read about them in the newspaper. For each event, write a letter to the editor of one of the newspapers, giving your reaction to the event described and the coverage it generated. As the film notes, by banning steam-powered locomotives from the city, New York forced the New York Central Railroad to be a pioneer in the new technology of electric trains, thereby reducing pollution in the city. Today, of course, much of New York's pollution comes from cars. Should the city ban conventional, gasoline-powered cars as a means of encouraging residents to buy hybrids or other cleaner vehicles instead? Imagine that New York City is planning to hold a referendum on that question. Divide the class into two groups -- one in favor of the proposal and one against it -- and have the two groups produce one or more campaign posters, radio ads, and jingles to persuade people to vote for their side. Students should consult outside sources for biographical details about their subject that would strengthen his argument for the honor and then include those details in their presentation. For example, Vanderbilt might mention his roots in the New York area, and Warren might mention the other New York buildings he helped design. For example, students might imagine that they were passing through New York on a train journey and spent several hours in the terminal, during which they photographed other passengers waiting for their trains and wondered what those people's lives were like. Or, they might imagine that they are immigrants who settled in New York and have photographed the construction site as an example of the city's dynamism. Where appropriate, letters should draw connections among events. 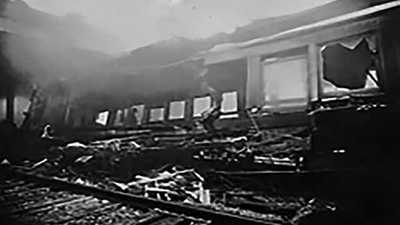 For example, how might memories of the 1902 Park Avenue Tunnel crash affect a person's reaction to the 1907 Woodlawn crash? How might memories of the terminal's 1913 opening affect a person's reaction to the "Luxury Liner" introduced in 1938. Students looking for examples of cities that have regulated car use may want to research the "congestion charge" London has imposed on cars entering certain areas of the city.